An effective antimicrobial skin cleanser. Use to replace green-soap and in-process washes. 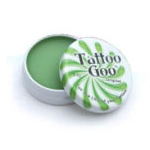 Use to keep fresh TATTOOS & PIERCINGS clean during the healing process.